It's the home stretch now for Christmas. If you haven't mailed your cards you will probably have to hand deliver them. No matter what the weather is outside a cozy decorated fireplace always makes the season seem brighter. I started with a great sketch from Card Patterns and used Cherry Cobbler dotted ruffled ribbon, gathered it and sewed down the middle to hold it in place. 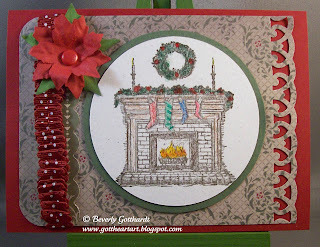 I used PrismaColor pencils to add a touch of color to the fireplace, a Martha Stewart border punch and a Making Memories poinsettia are the final touches to a warm inviting card. What a perfect, little, Christmas creation! LOVE that textural edge with the ribbon and poinsettia! Yummy! This is gorgeous Bev ... 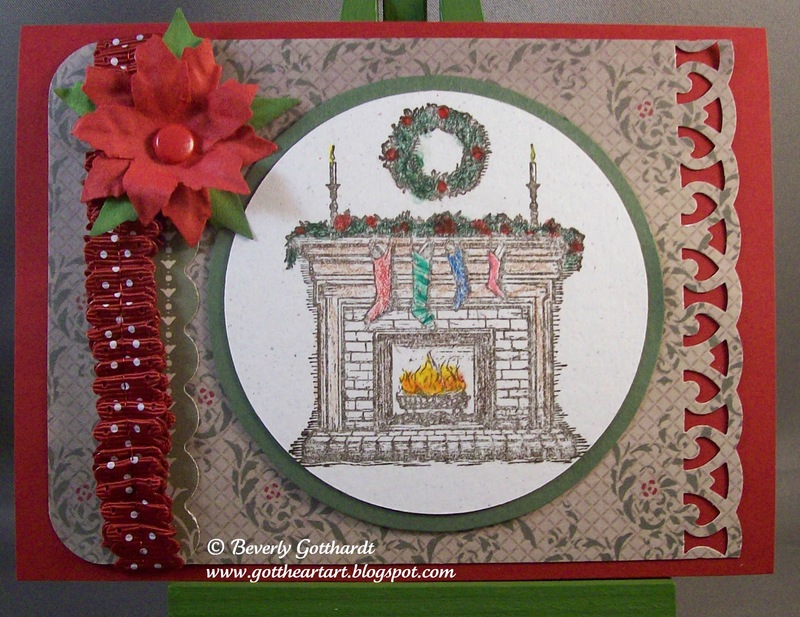 I so love your cosy looking fireplace and you have coloured it great .... your border and your poinsettia flower is just beautiful! I love all the textures and your attention to detail. Thanks for playing with us at Card Patterns this week. i just love the detail. I really like how you added a decorative trim to the right side of your dsp. great touch. and the hand made poinsetta is perfect!